All around the world today, people are rediscovering the ancient practice of cat dancing, tapping into this remarkable method of channeling feline energy. Share the gift of feline grace, and connect with your cat on an intirely new level. Let yourself be inspired by the joyous photographs and moving testimonials within this books pages. A brave leap forward in the history of human-feline relations, Dancing With Cats will have you and your cat jumping for joy in no time. Working with Tibetan cat charmers in the Himalayas, world renowned biomusicologist David Parsons, discovered just what sounds and rhythms were most likely to stimulate cats to dance. He has taken these sounds, found an analog for them on his synthesizer, then combined, multiplied and re-synthesized them with real inspirational cat cries offset with deep healing purring, and even subtle licking noises to create a beautiful complexity of cat sounds and rhythms  a completely new feline soundscape that captures every nuance of your cat¹s exuberance and grace. This is the essence of David Parsons' music. 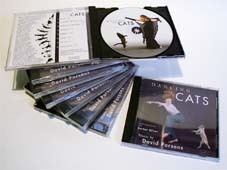 Music which will allow you to experience the core of your own feline sensibility and respond to its inner message. 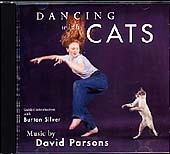 Primal harmonies which will excite both you and your cat to dance together in a way that sanctifies your passage through from the synchronicity of movement and the melding of energy patterns to the highest places within yourself and your feline partner. 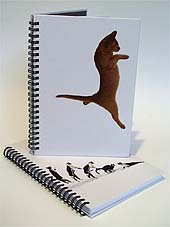 Solo Cat journal and Black and White Cats journal. Lined, spiral bound. Intriguing, dynamic, and graceful, these are cats as you have never seen them before. 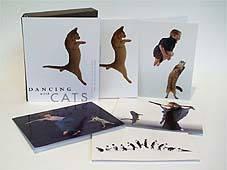 Featuring highlights from the book Dancing With Cats, this assortment of 20 notecards (5 images repeating 4 times) will delight all the cat lovers in your life. 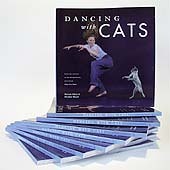 Dancing With Cats gives people and cats reason to rejoice, to jump up in the air ... and dance. Site design and implementation by Catch 22. Images and text copyright 1999 Origination Trust.